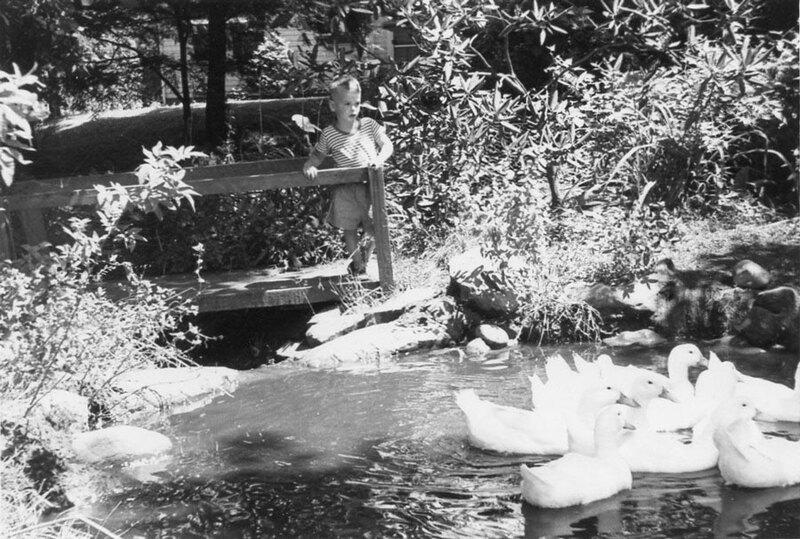 My brother Jeff watched the ducks enjoy our backyard stream. Audiences are trained to expect comedy from ducks. Consider Donald. Also Daffy. And, of course, the Marx Brothers, who, while not ducks themselves, knew the value of a good duck joke. So perhaps it’s understandable that when writer/director Nicole Bettauer’s 2005 independent film Duck was released some people were dismayed by the serious issues and quiet tragedy embedded in the plot. Some internet ranters apparently felt that they’d been swindled, sold a false bill of goods. And in their defense, it must be said that the movie’s original tagline: “Think outside the flock,” is a bit enigmatic. I was instantly intrigued when I first learned of the film. I put it in our Netflix queue last year. And there it sat, for months, constantly bumped lower by some shiny new release, or “important” film that had to be seen. But last weekend “Duck” finally waddled out of the queue and into my heart. That’s right naysayers. I liked it. Yes, it made me cry. But it also made me feel somehow hopeful in spite of everything. And if you’ve been reading your newspapers and feeding at the online Trough of Doom, you know that only lottery ticket buyers and reality show contestants really know how to hope. The film stars longtime character actor Philip Baker Hall as Arthur Pratt, a widowed man in Los Angeles who has lost everything while caring for his dying wife. At the start of the film he is planning to end his life. So then, the moment duck fans have been waiting for: an orphaned baby duck comes into the picture and takes an immediate shine to Arthur. In some other film, this could have evolved into a sort of Up parable about destiny, making the most of every minute, blah, blah, blah. (Don’t get me wrong. Up is great. But apples and oranges.) What transpires in Duck is more of a mystic journey through the loveless underbelly of a dying city. Yay! Dystopia! It’s all the rage. As a suddenly homeless person, with a duck, Arthur has to find a way to survive in a society that views him as a quack. I won’t spoil it for anyone who might want to see Duck, but I have to say, there are some surprises. There are lots of movies about boys with dogs, girls with horses, even musicians with cats. There aren’t a lot buddy movies with a duck as the co-star. It’s possible I was drawn to this film because in the first years of my life we had ducks at the house where I was born in Erie. A small stream with a little bridge over it ran through the backyard. 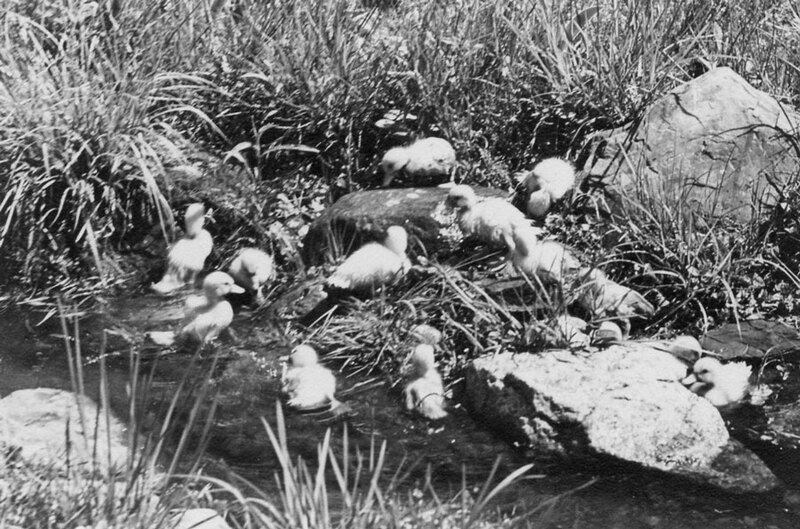 My dad bought a bunch of baby ducks that lived for a while in a pen until they got big enough to paddle in the stream. I don’t know what happened to them after we moved away. I’d like to think their offspring are still swimming around in Lake Erie, unless they’ve relocated to L.A. to work as extras on Duck Two: The Punchline. Baby ducks just naturally go with the flow.